Home » Viral Posts » OMG: Is he a crazy or got Talent? OMG: Is he a crazy or got Talent? Of all the bizarre talents to have in the world, this guy's are definitely among the most cringeworthy. 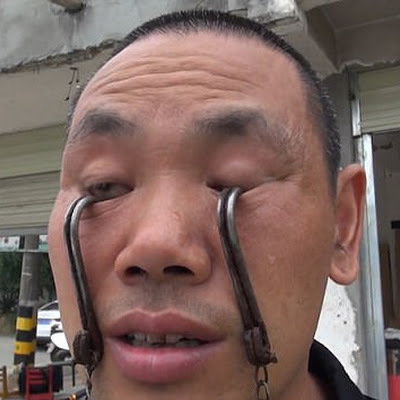 Wu Song, a Kung fu master and snake charmer from Chengdu, China, prides himself on his disturbing ability to not only thread live snakes through his nose and out of his mouth, but to also lift buckets of water using hooks hanging from his eyelids. The jury's still out on why he would ever want to do either in the first place, but Song says he started practicing under the guidance of Kung Fu masters when he was 12.Now he wants his son, Xiao Yong, to master the techniques as well. When you see him showing off his talents below, though, you'll understand why Yong isn't quite as enthusiastic about following in his dad's footsteps.